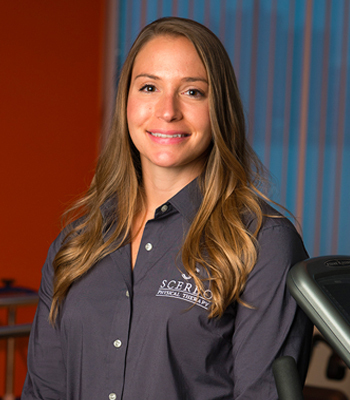 Dr. Nicole M. Lombardo PT, DPT, CSCS received her Doctorate in Physical Therapy at Rutgers University. She completed her undergraduate degree in Biological Sciences at the University of Delaware, where she long and triple jumped for the Women’s Track and Field team. It was through her track career that she developed a passion for fitness and health. After her undergraduate studies and all throughout physical therapy school, Nicole spent time personal training and coaching CrossFit, deepening her knowledge of and love for functional exercise, gymnastics, and Olympic lifting. Suffering an injury herself, due to poor form and lack of self-education, she understood the importance of performing exercises correctly and safely. Since then, she has made it her mission to use her knowledge and experiences to educate others and ensure that none of her patients get hurt the same way she did. Nicole continues to coach CrossFit in Hoboken to children and adults of varying fitness levels. She enjoys integrating her knowledge of the human body and exercise to optimize the fitness and modify exercises for each member as needed. She holds a certification in CrossFit Level 1, CrossFit kids and is currently studying to become a Certified Strength and Conditioning Specialist through the National Strength and Conditioning Association.